Wall mounted steel racks provide an easy way to store athletic and sports equipment easily while keeping everything organized and properly stored. Available in five different widths, the wall mounted steel racks can store anything from exercise balls, shoulder pads, rackets, and much more. 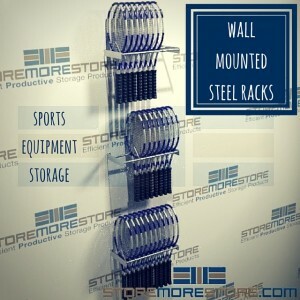 The wall mounted steel racks keep your athletic and sports equipment off the floor and safe from damage. Steels racks are available in five widths (30″, 36″, 42″, 48″, and 72″) to accommodate any wall space. They are also easy to install and use by mounting to the wall using four wall anchors. The steel racks are available in depths of 15″, 17″, and 18″. Steel racks are ideal for organizing and storing tennis rackets, as it stores them by the head beam instead of the strings to prevent damaging the strings’ integrity. They can also store all types of exercise balls, yoga balls, stability balls, sports balls, and physio balls. Shoulder pads and protective gear, field equipment, helmets, and other sports gear can also be organized and stored safely. Steel racks can be mounted in rows or columns to maximize storage space and store more equipment in a smaller area than shelving and other storage systems. With the wall mounted racks, you can utilize your existing wall space instead of your valuable floor space—freeing it up for other uses and activities. 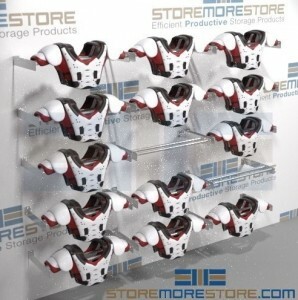 Wall mounted steel racks for athletic and sports equipment storage are available to buy online. Racks can be installed quickly with no professional services needed. However, if you need assistance or would like to speak with a specialist, call us at 1-855-786-7667.